Cute A-Line skirt for your cheer squad! In Stock Metallic 1 color plastic show poms in with baton handles ship from Ohio in 1 business day. Minimum order 12 poms. 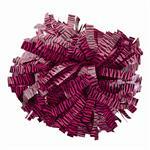 In Stock metallic/zebra 2 color show poms in with baton handles ship from Ohio in 1 business day. Minimum order 12 poms. Metallic Boy Cut Briefs adult & youth in 10 popular colors. Minimum order 6 pairs.